2. Bring FALL fabrics to give to Linda, Kay, and Jane, who will use the fabric to make “10 minute table runners” as door prizes for the Bonnie Hunter trunk show.. Each runner takes 1/2 yard of one fabric and 1/3 yard of coordinating fabric. All FALL fabric is appreciated! Thank you Linda, Kay, and Jane for coordinating this and making the table runners. See you on Wednesday at the Methodist Church! Reminder: The HOF Guild’s Christmas Party will be held Wednesday, December 17, 2014, at the First United Methodist Church at 6:30 p.m. Note: If you have not signed up for the Christmas Party, there is still time! Please click on our RSVP form and fill out the information. You may also email Andrea O’Brien at andiobrien@gmail.com DEADLINE to sign up is December 12th. IMPORTANT: Instead of exchanging presents, we will make a donation of canned goods to the local food bank and the Mission. Rose Marie and Gloria will take care of transporting the food to the two organizations. So, ladies, raid your pantry and fill up a bag of canned goods and bring them to the party! Let’s help our community. Together, we can make a difference! Be sure to wear your UGLIEST sweater. Bring an UGLY fat quarter, wrapped, with your name on it. Bring canned goods for our local food pantry and Mission. Due to unforeseen circumstances we will not be distributing quilts @Illinois Veteran’s Home at this time. I have spoken w/Brad Young of our local guard unit about distributing quilts to our local guard soldiers that have returned from Afghanistan earlier this year. The number of quilts to be distributed will be about the same. I know that some of you were not going to be able to go to Quincy because of work, the time frame, etc. These quilts can be taken to our local soldiers on Monday or Tuesday. I am meeting w/and getting names, etc. on Monday morning and will setting up a meeting place to get quilts to those distributing. If any of you would like to help distribute we would love to have you join us or you can deliver a quilt yourself. Please contact me @ 660 342 2756 if you would like to distribute quilts so that I can get a quilt to you. Again, thank you for all of your hard work in blessing our veterans. We are proud and thrilled to make this announcement! 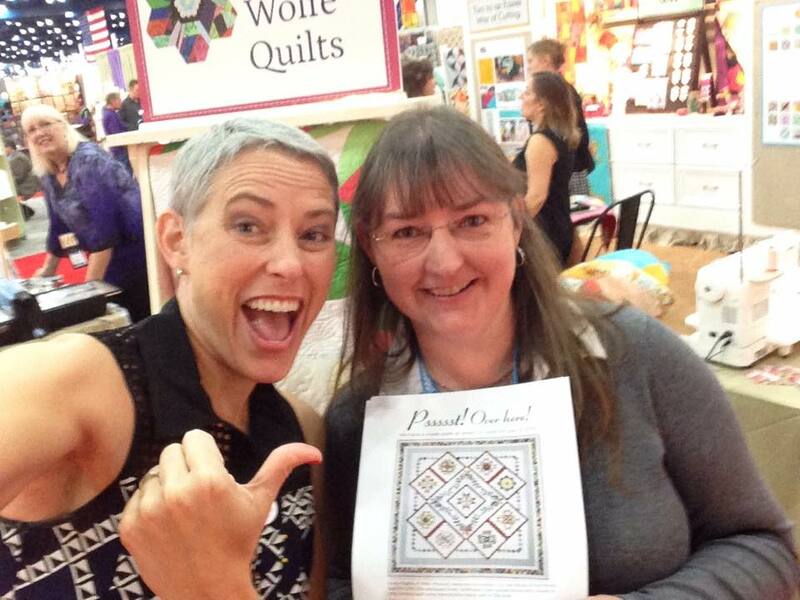 Our very own Shelly Pagliai’s quilt is the 2015 Kansas City Star BOM!!!! Wahoo!!!! Greetings, everyone! Welcome to “The Hands of Friendship Quilt Guild Blog”. We are excited to share this blog with our guild members and others. We hope it will be a source of helpful and fun information along the way. Our blog is a work in progress and information is constantly being added. If you have photos and other items you would like added to this site, please send it to: handsoffriendshipquiltguild@gmail.com and be sure to include as much contact and descriptive information as you can.